The United Kingdom is a member of NATO (North Atlantic Treaty Organisation) and the majority of military operations are conducted in concert with the forces of NATO allies. In 1993, NATO was reorganised from three into two major Commands with a further re-organisation of these two commands in 2003. The first is ACT (Allied Command Transformation) with headquarters at Norfolk, Virginia (USA) and the second is ACO (Allied Command Operations), with its headquarters at Mons in Belgium. NATO Operations in which the United Kingdom was a participant would almost certainly be as part of a NATO force under the command and control of Allied Command Operations (ACO). The current Supreme Allied Commander Europe (SACEUR) is Admiral Stavridis. SACEUR, (a US officer) is responsible for the overall command of NATO military operations and conducts the necessary military operational planning, including the identification of forces required for the mission and requesting these forces from NATO countries, as authorised by the North Atlantic Council and as directed by NATO's Military Committee. The following nations are members of the NATO Alliance. Albania, Belgium, Bulgaria, Canada, Croatia, Czech Republic, Denmark, Estonia, France, Germany, Greece, Hungary, Iceland, Italy, Latvia, Lithuania, Luxembourg, Netherlands, Norway, Poland, Portugal, Romania, Spain, Slovakia, Slovenia, Turkey, United Kingdom, United States. 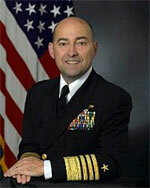 Admiral Stavridis is a 1976 graduate of the US Naval Academy and a native of South Florida. A Surface Warfare Officer, Admiral Stavridis commanded the Destroyer USS Barry from 1993-1995, completing deployments to Haiti, Bosnia, and the Arabian Gulf. USS Barry won the Battenberg Cup as the top ship in the Atlantic Fleet under his command. In 1998, he commanded Destroyer Squadron 21 and deployed to the Arabian Gulf, winning the Navy League's John Paul Jones Award for Inspirational Leadership. From 2002-2004, Admiral Stavridis commanded Enterprise Carrier Strike Group, conducting combat operations in the Arabian Gulf in support of both Operation Iraqi Freedom and Operation Enduring Freedom. Ashore, the Admiral has served as a strategic and long range planner on the staffs of the Chief of Naval Operations and the Chairman of the Joint Chiefs of Staff. At the start of the Global War on Terror (GWOT), he was selected as the Director of the US Navy Operations Group, DEEP BLUE. He has also served as the Executive Assistant to the Secretary of the US Navy and the Senior Military Assistant to the US Secretary of Defense. Admiral James Stavridis assumed command of the US Southern Command on October 19, 2006. Admiral Stavridis earned a PhD and MALD from The Fletcher School of Law and Diplomacy at Tufts University in International Relations in 1984, where he won the Gullion Prize as the outstanding student. He is also a graduate of both the US Naval and US National War Colleges. In mid-2009 Admiral Stavridis was appointed as the Supreme Commander Allied Powers Europe.